"[T]he values to which people cling most stubbornly under inappropriate conditions are those values that were previously the source of their greatest triumphs." In Collapse: How Societies Choose to Fail or Succeed, Jared Diamond (UCLA professor of Geography) described the collapse of civilizations as a gradual environmental process, fueled by systematic behavioral weaknesses evident in inertia and short-term thinking, culminating in a rapid unwinding too rapid to stop. As he describes it, as environmental stress increased in prior failing societies, social and economic disparities widened. Rather than looking to identify empirical causes and create functional solutions to save themselves, these societies fractured along political and class lines. As stress increased, the various factions hardened their tactics, ultimately physically attacking internal political enemies and igniting civil wars which destroyed the social and cultural mores that upheld institutions. I was reminded of Diamond's thesis a few weeks ago in Canada, of all places. I was in Toronto's financial district when I was handed, with a direct and sincere look, a manifesto on the evils of capitalism. Now, when I lived in San Francisco and Austin (two cities I love), I often received such manifestos - usually followed by some unsolicited recommendations regarding marijuana cultivation or freeing Tibet. It was all fairly benign. But the Toronto pamphleteer was not unhinged, malodorous, or intoxicated - he was sincere, healthy, and appeared overtly rational. His apparent reasonableness shocked me more than the manifesto itself: A reasonable man pushing an overthrow of capitalism. That same night, student riots in Montreal over tuition increases led to the arrest of 122. Democratic governments in the developed world have borrowed money to finance their promises. Without displaying adequate performance. As a result, voters are disappointed and angry, and now inclined to try extreme alternatives. While I'll discuss social collapse in light of Greece this week, I think we should also take this opportunity to look at our own societies. The unraveling has already begun. What can we do to prevent a similar meltdown? I consider myself optimistic, so it pains me to return to the topic of collapse. That said, I'm of the opinion that facing an ugly truth sooner allows us to have a happier life later. Sadly politicians have the incentive to avoid hard choices in the short term, and as a result the pain of collapse will be that much greater. New public policies that account for human (and elected official) psychological weaknesses are desperately needed. Fortunately, such an effort has begun. Read on to learn more. In the past month we've been speaking and training in Toronto, San Diego, Quebec, Las Vegas, and Istanbul (what a lovely city! ), and we'll be in London, Las Vegas and Quebec (again) in the next 30 days. The London News Analytics Roundtable in Canary Wharf on June 18th is a must-attend if you use sentiment data. We look forward to catching up with our friends in those cities. We still haven't launched our weekly investment newsletter, but we're on the verge (just two more weeks)! Click here to receive our weekly investment strategy newsletter (if you already requested the Newsletter, then this step is unnecessary). We've been intensively expanding our data architecture in order to capture even more interesting data and predictions to share with you. We will also be adding separate financial advice and global social commentary in separate monthly newsletters. More about those as they prepare to launch. I'll be relocating to the New York City area this summer. It has been wonderful in California, and I hope to return to the San Francisco area soon - but for now family and clients bring us East. And Buffett’s Successor Is… Jason Zweig. Wall Street Journal. April 23, 2012. Trading on Sentiment. Fox News. April 21, 2012. VIDEO. Psicofinanza : per investire spiate Twitter. Matteo Motterlini. Corriere Della Sera. “Pro stock traders looking to Twitter, Facebook for tips.” Walter Hamilton. Los Angeles Times. March 30, 2012. Tweet If You’re Still Trading: Funds for the Birds?. Robin Blumenthal. Barrons. June 2, 2012. Dementia and Due Diligence: Why Clients’ Cognitive Function Is Your Concern. Savita Iyer. Advisor One. April 26, 2012. How to Help Clients Hold On. Katie Keir. Advisor.ca. May 25, 2012. Brandes Scholarship Program encourages financial literacy among Canadian youth. CNW Group. May 24, 2012. Last year I commented to an acquaintance of mine in Europe, "I wonder how long until the Euro falls apart?" He dismissively remarked, "The Euro won't dissolve. It can't." When I asked why it can't, he explained, "Well, what would happen then? It's impossible." This line of reasoning is a bit like telling Columbus in 1492, "No one knows what is over the horizon, therefore you cannot sail that way." This flawed logic reflects a psychological stage of child development called object permanence. he or she cannot see, hear, or touch are still existing. The concept of object permanence explains why peek-a-boo is such a hilarious game for infants. When you disappear behind a couch, they truly feel, "Oh, how disappointing!" And then you suddenly jump up and reappear, prompting a happy revelation: "He's back, what a thrill!" And giggling ensues. Adults have a similar problem with inconceivable outcomes - if a potential outcome is too complex or unprecedented, we ignore it (and don't prepare for it) because it is impossible. As an adult might say, "It is impossible for countries to leave the Euro because the consequences are unfathomable." This statement is a bit like a child playing peek-a-boo - if I can't conceive it, then it doesn't exist in the realm of possibility. The last four years we've been playing peek-a-boo with the specter of first Greek default and then Greek exit (Grexit) from the Euro. Every six months the specter pops up again, and markets react with the same incomprehending fear until a stop-gap is agreed upon. The fear of Grexit and financial Armageddon caused credit markets to freeze - as European credit markets did the past few weeks. Each time this has occurred previously in the past 4 years, governments step in as counterparties, the specter of crisis dives behind the couch, and the market's short-term fear is dissipated. Every time credit markets freeze, a catastrophic concern emerges - that this time the specter will "get us" and financial collapse truly will ensue. The concern is a logical one that arises from experience with herd behavior: If you are a lender, and your peers are also beginning to restrict credit, then you yourself are incentivized to stop lending. No one wants to be caught holding the bag. So each lender tries to stop lending first. This cycle is repeated every six months and is only stopped by a convincing short-term response from political leadership. Our news and social media monitoring software shows this cycle in conversations about Greece. In Greece, the focus of anxiety is shifting over time. In the image below, all lines represent levels of conversation about Greece specifically. In the image are significant spikes in chatter about Greek Unemployment beginning in Spring 2009 (blue line), in late 2009 Fear rises in conversations about Greece (pink line), and in April 2011 a Greek Debt Default becomes a real possibility according to the media (red line). Was it the rise in unemployment that ultimately sparked high stress in Greece? As fear remained high around Greece, more extreme events were facilitated. Ultimately, debt default became more concerning, and then occurred. As we described in our webinar last Fall, democratic citizens will not vote for politicians who keep the pain coming. Witness Sarkozy's loss, the rise of Tsipras in Greece, and the surprising success of the brutal Greek far right party - the Golden Dawn. So what will a stressed public do? They will vote for severe short-term pain ("rip off the band-aid" therapy) in order to escape the cycle of continued slow suffering. This is capitulation, a precursor of economic collapse. Cognitive psychologists have identified numerous emotional biases that distort our thinking when we are feeling stress. These biases have self-explanatory names such "black-and-white thinking", "over-generalization'", and "catastrophizing." Catastrophizing is the bias I'd like to use to illustrate what is happening to the thinking of the European public. Catastrophizing refers to overestimating the odds of severely negative events happening. Catastrophic thinking has its roots in our genes and neurochemistry. Think about it: it was better that our ancestors over-estimated the odds of a disaster than underestimated. They would have been culled from the gene pool if they were under-prepared for potential danger, if it actually struck. As a result, we are descended from "Nervous Nellies." We are hardwired to think the worst in dangerous situations. The most apparent example of catastrophization occurs in the way we estimate probabilities of unlikely, but potentially severe, events. The image below depicts our overestimation of small probability negative events. "Affect-rich" refers to the odds we place on events that have vivid and emotional signs, like riots and burning buildings in Greece. "Affect-poor" refers to the odds we place on objective, boring events, like the chance the next Euro notes will have a picture of the Copenhagen-Malmo (Øresund) Bridge. As the curved line deviates above the straight diagonal line, it represents the increase in estimated probability above the actual level for Affect-Rich (high emotion) events. 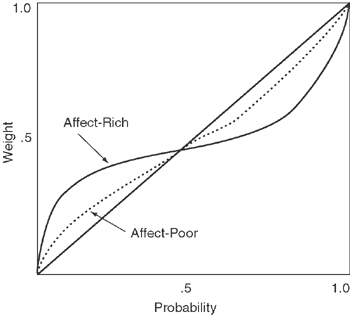 Affect-Poor events are also overestimated, but less so. SOURCE: Image adapted from Hsee and Rottenstreich: “Music, Pandas, and Muggers: On the Affective Psychology of Value” (2004). Fortunately, we do not have to be passive victims of our own catastrophizing. Cognitive psychologists have found that we can consciously supplant anxious thoughts with unbiased and objective thoughts, thus reducing the core emotion - anxiety - and interrupting the positive feedback loop and mental "spinning" that anxiety causes. Consciously thinking unbiased thoughts acts to calm anxiety, and thus we can intentionally modify our thoughts via cognitive therapy techniques, reducing biases such as catastrophizing. In the case of Greece and the Euro-zone, it's important to keep this in mind as the crisis intensifies. We are all emotionally primed to feel anxious by the media. As investors, however, it is key to remain objective (and contrary) about the herds' emotion. The best way to remain objective is to consider the cognitive processes that have already and that will unfold among European leaders, voters, and investors. The four Researcher's Corner sections below articulate findings that shed light on how humans repeatedly get into bad financial situations through short-term thinking, why we "kick the can down the road" to avoid short-term pain while risking longer-term disaster, and how a final capitulation occurs. This May Harvard behavioral economist David Laibson gave a fascinating talk at UCLA about some of his latest behavioral research. Dr. Laibson is well-known academically for adapting a hyperbolic discounting model (the beta/delta model) to describe how people make saving, spending, and investing choices. He's also done terrific work on cognitive decline and financial decision making, which we cite in our MEMRI script for financial advisors. In his recent UCLA talk, Dr. Laibson described research he performed with John Beshears (of Stanford) and colleagues. They tested a model of savings in which subjects were given a choice of a "liquid" savings account (they can withdraw money at any time) versus a savings account with an early-withdrawal penalty. After one year, the subjects who kept their money in either savings account would receive the original savings plus a 22% return. The researchers tested several combinations of punishments for the early-withdrawal condition. Some could choose to receive their experimental earnings either in the freely liquid account or in the one with a 10% early-withdrawal penalty. Another group could choose between the liquid account and an account with a 20% early-withdrawal penalty. A third group chose between the liquid account and an account with no ability to withdraw funds until the year was up (a lock-up account). Remember, the subjects received a 22% annual return on their savings in whichever account they chose. Rational expectations theory assumes that people have perfect self-control, and as a result they should choose the fully liquid account option (in case of an emergency or a higher available return, they could then withdraw the saved money for that purpose). Contrary to rational theory, many people chose to use the penalty-accounts with the percentage choosing the penalty accounts increasing as the potential penalty increased. More than 20% of subjects chose the 10% penalty account in the first group. In the second group more than 30% of subjects the 20% penalty account, and in the no-withdrawal condition more than 50% of subjects chose this account for their savings versus the liquid account. Many people voluntarily chose future punishment in case they withdrew their money early. Technically speaking, people will chose the threat of punishment against their future selves in order to enforce self-control on them. So we know that we are weak at exerting self-control over our savings. Are our government leaders equally as weak? There is no checks-and-balances system set up to prevent politicians from over-spending. Yet in a democracy, elected officials have an extra incentive to boost spending for their constituencies in advance of voting. The result of such overpromising is that social security and healthcare promises are easy to make before elections, but eventually those promises come due. The developed world is now faced with an obvious negative predicament - our future promised liabilities far exceed our ability to pay them. Most governments can print money to fund liabilities (a stealth tax via inflation) and use stimulus measures, but there is moral hazard with such a solution - the fear that there is no end to such printing by elected politicians once it is made morally acceptable. Yet fiscal austerity creates short-term pain, and if it does not lead to growth within a 2-year election cycle, then it is often abandoned by politicians promising easy fiscal solutions (stimulus). So what can we do to break this cycle? To understand solutions, we must first understand how we got into this position. Psychologist Daniel Kahneman shared the 2002 Nobel Prize in Economics for his development of Prospect Theory with Amos Tversky. Prospect Theory is a model of decision-making under risk, based on experimental evidence (in contrast to most economic theories), that describes how people decide when faced with potentially negative outcomes (risk). It turns out that people behave very differently depending on their "reference points" (essentially, their expectations). For example, when people are in a bad situation, and they have hope of recovering via perseverance, they generally INCREASE their risk-taking. This increase in risk-taking is also called "doubling-down" and is driven by what Hersh Shefrin and Meir Statman called the disposition effect (a.k.a. "breakeven-itis" - the desire to get back to a neutral position). This is the psychological process that drives that bane of traders, "holding onto losers too long." Holding onto losing positions too long (in the form of "throwing good money after bad" and the "sunk cost" bias) is also a scourge of taxpayers and is seen in expensive never-ending over-budget military projects like the "stealth bomber" and infrastructure projects like "the Big Dig" in Boston. The Euro-zone has so far thrown tens of billions of good money to Greece (and now $125 billion to Spanish banks) with the hope that after receiving this money, Greece would reform. Greece not only did little to reform its tax code or pensions system, but also many Greek voters spurned the bail-out, labelling it German imperialism. Europeans might justifiably feel a bit angry by the intransigence of the Greek government. And it is this anger, as it gives way to hopelessness, that will reset the European reference point (expectations) from hope to despair - from potential recovery in Greece, to Greece as a lost cause. But while hope has given way to despair regarding Greece, there is still - on balance - hope that the remaining members of the Euro-zone can find a solution for themselves. Neuroscientist Wolfram Schultz demonstrated that our brain's learning mechanism is fueled by one of the brain's dopamine circuits (the meso-limbic, which runs through the reward system). Interestingly, this system is most responsive to expectations (the reference point). When expectations are increased by rumors or potential positive events, a surge of dopamine is released. When the expected event happens, if it is in line with expectations, then the dopamine level does not change. When rumors of a Spanish bank bail-out hit the news, world financial markets rallied and finished last week as their best week of 2012. The reward systems of traders were excited by the anticipation of some relief. After the Spanish bank bailout was announced, European markets gapped up on the good news but ultimately sold off, down more than 1% for the S&P 500 by end-of-day. So what happened? When positive expectations are met (or worse, disappointed), then the dopamine system deactivates, leading to decreased dopamine activity and decreased risk taking. In the case of traders, such deactivation from calmed expectations leads to selling. Below are Schultz' images of how the brain's dopamine neurons in the reward system respond to rewards ("Reward") and how they respond when expectation of reward are set ("Stimulus"). 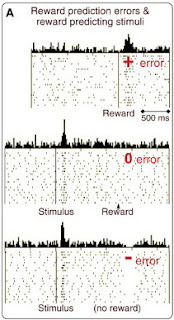 Notice that the frequency of dopamine neuron firing increases in the second image when the stimulus is received (and expectations are set), but decreases very slightly when an expected reward is received. Dopamine firing pauses entirely in the third image when the expected reward is not received ("no reward"). Schultz' work is relevant to the Euro crisis because it can trace much of the price volatility to the fear of disaster, then expectations of short-term salvation (saving the Spanish banks), then disappointment when expectations are met (or disappointed), and finally the next crisis looming into view. When Euro-zone leaders meet, expectation (and hope) is high that they will present a coherent plan. When they do not present a workable plan, markets plummet. Sometimes European leaders surprise with temporary relief measures, and the markets rally for a few months until it again becomes clear that Euro-zone economies are worsening, thus necessitating further bail-outs. This cycle of expectation-setting, disappointment, and relief is emotionally exhausting for market participants. More importantly, it becomes exhausting for the European public and the leaders themselves. Such exhaustion leads people to try to escape from the noxious situation. If positive means of resolution are not found after 2-3 years, then drastic measures are viewed as more desirable - anything to "stop the pain", including more severe short-term pain as long as some ultimate relief can be seen on the horizon. As long as there are multiple potential outcomes (uncertainty), investors will shun European equities and bonds and eventually the Euro. At this point, a workable plan will involve political and budgetary check-and-balances, if not a direct political union, to balance the monetary union. Once that uncertainty is resolved (a "probability collapse" in psychological jargon), a real relief rally will ensue. The founders of the United States appeared to understand the human psychology of power (and the ease of corruption). As a result they designed a governmental system of checks and balances between the executive, legislative, and judicial branches to prevent excess power in one branch. Yet democracy can be undermined by excessive short-term thinking with finances and budgets. There is no legal check on the power of legislators to over-promise and overspend, and voters have little ability to understand (nor react appropriately to) fiscal profligacy among leaders. Fortunately a group of UCLA behavioral economics researchers founded a behavioral policy journal to stimulate ideas and research in improving public policy through an understanding of behavioral incentives. The journal's founders also provided the Obama campaign with strategic tips on boosting fund-raising. The George Clooney celebrity dinner? Yes, behavioral economics-inspired. The lottery for a "regular-guy" seat to that dinner? Also behavioral economics in action. One enjoyable aspect (perhaps the only pleasant part?) of this year's U.S. presidential contest will be watching behavioral strategy employed. We've expanded our text-analytic software to include political figures, so we'll keep track of the major races this year out of personal curiosity and will keep you posted on our findings. Clearly there is a lot of fear in Europe. 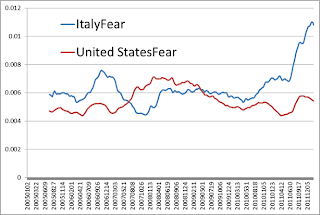 Below is an image of the amount of Fear expressed in all news reports about Italy versus the United States through January 2012. 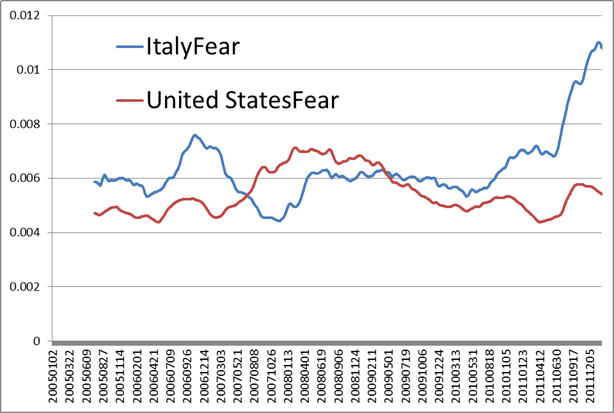 For several years Italy managed to avoid the contagion of the Euro-zone instability. But now fear is squarely on Italy's doorstep. Because of such fear in the Euro-zone, investors have fled in droves. The Economist Magazine recently noted that European equities are trading at an average P/E ratio of 11, while U.S. equities have a P/E of 18. As a result, European stocks are "cheap", and once the uncertainty is resolved, a massive rally may ensue. Southern European bank stocks are a call option on a Euro-zone reconciliation, but there is a risk of nationalization of dysfunctional banks. Financial firms that were indiscriminately sold alongside European banks, such as insurers and brokerages, are better investments. In the short-term, the next anticipated event is the Greek election of June 17th. The outcome is uncertain, but a favorable short-term result (favorable for Greece to stay in the Euro) is likely. That said, Germany still must decide whether or not to deliver additional bailout payments, and given Greece's lack of tangible progress in reforming their tax collection system and pensions, additional bailout funds are uncertain. Ultimately, the European volatility will continue, to be followed by an acrimonious American election. Yet as Warren Buffett has said, "The future is never clear, and you pay a very high price in the stock market for a cheery consensus. Uncertainty is the friend of the buyer of long-term values." That said, any relief rally will likely last for months of duration (not years) and then stall. The demographic headwinds facing Europe are significant long-run drags on the equity markets and economic growth. The uncertainty developed world markets face is more fundamental than at any time since the Second World War. Keep your chin up - this summer is a time to be thoughtful and opportunity-seeking during the short-term waves of anxiety as they sweep over markets. We love to chat with our readers about their experience with psychology in the markets - we look forward to hearing from you! We especially love interesting stories or your or others experiences.